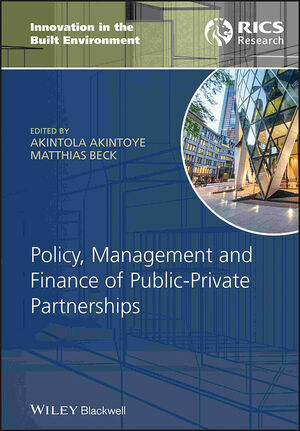 Contributions from Australia, Europe, the Far East, South Africa and the United States together present the current thinking and state-of–the-art approaches to public-private partnerships. 1.7Performance of PFI schemes -- a theoretical perspective. 1.9Performance of PFI schemes -- an empirical review. 7.2An overview of public--private partnerships. 13.5An integrated real options--risk management process for PPP infrastructure projects. sets a topical issue in a broad but clear theoretical framework. presents current thinking and state of the art approaches on public private partnership on the basis of contributions from leading academics and practitioners. adopts an interdisciplinary approach which gives equal weight to policy, financial and managerial aspects of public private partnerships.